Fig. 1. 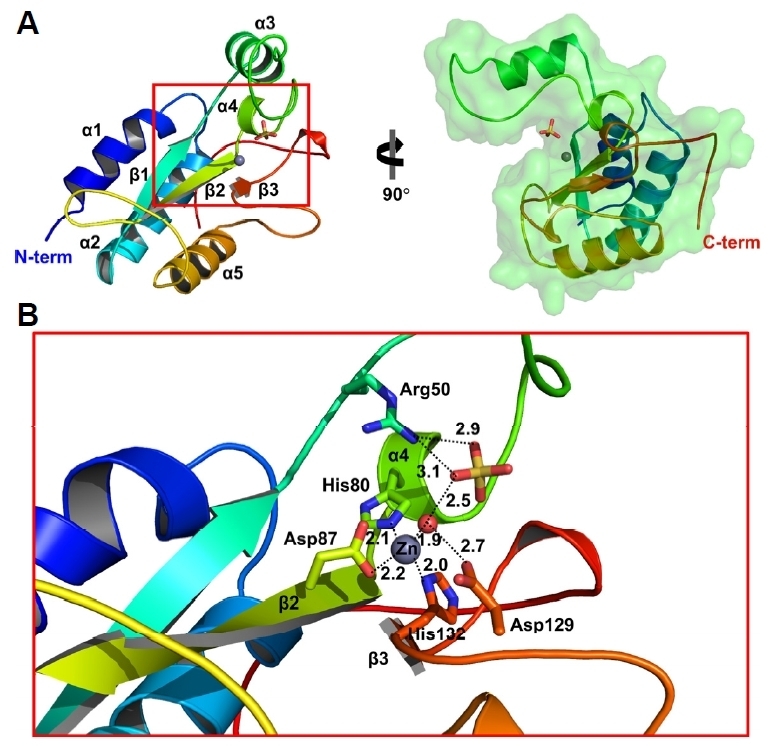 (A) The overall structure of the LysB4 EAD, consisting of five α-helices and one β-sheet with three antiparallel β-strands (the blue to red ribbon model in the left and the green transparent surface model in the right). Zn2+ is represented as the gray sphere, and a sulfate ion in the cleft is shown in the stick model. (B) A close-up view of the red inset in A. The Zn2+ (gray sphere) shows the tetrahedral coordination geometry with His80 from α4, Asp87 from β2, His132 from β3, and one water molecule (red sphere) in the cleft region. The adjacent sulfate ion is shown in the stick model and makes polar interactions with Arg50 and the bound water molecule. The distances are indicated by a dotted line (Å).